Today I was watching our Banggai Cardinalfish which are a fabulous reef safe fish. I suddenly realized – everyone with a reef aquarium should have 3-5 of these fish. If you want an elegant reef safe schooling fish that looks super cool, this is the fish for you. You may have heard this fish called by a few other names. They are often referred to as a Banner Cardinal, Kaudems Cardinal or a Longfin Cardinal Fish. Banggai Cardinals are typically around 2 inches at max size. 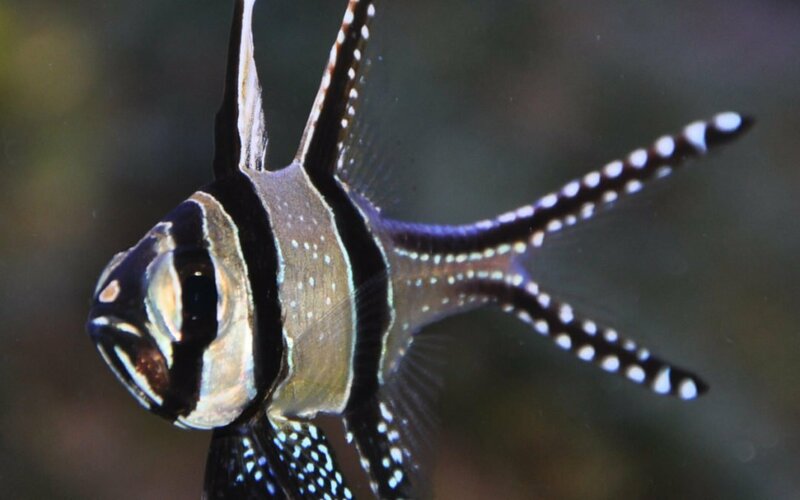 The coloration of the Banggai Cardinalfish is quite impressive. The silver tan body is punctuated with black stripes, containing white polka dots like markings. My group of Banggai Cardinalfish are extremely docile, making this one of my favorite schooling fish. Banggai Cardinalfish are limited to the Banggai Islands of Indonesia. With such a small geographic habitat, it is critical that aquacultured specimens be your first consideration. Without a concerted effort by the aquarium industry to demand sustainable options, over-harvesting & ultimate extinction is a real threat. 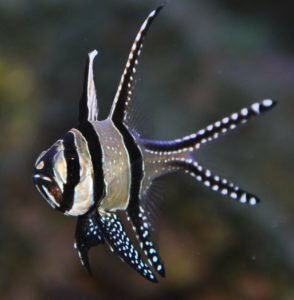 Fortunately, these beauties breed easily in captivity, and multiple aquafarm facilities have started breed programs for Banggai Cardinals for the aquarium trade in large, consistent quantities. One of the most amazing sites to see is a group of young Banggai Cardinals hiding within the spines of long spine urchins. These fish are commonly found in shallow pool of 500+ animals grouped together hiding from predators among the long spikes of the urchins. At a recent trip to one of our wholesalers, I noticed several very small Banggai Cardinals which had recently been born swimming among the selection of leather toadstools. They were as small as a standard pencil eraser on the end of a yellow #2 pencil. Grabbing my Nikon fitted with a 105 Macro Lens & Underwater housing, I quickly began shooting their pictures but to no avail. I will attempt another photo shoot shoot so you can experience this wonderful birthing event. Just got your new saltwater aquarium? 1. Choose your poison very carefully. What I mean is – with your saltwater aquarium do you want a friendly nice communal tank or do you want an aggressive tank. No matter what size saltwater aquarium you have – you can do either if planned well. So think about the main fish & animals you like then make a list. Classify each animal by the following characteristics: Mature size potential, Food Choice, Schooling or Solitary, territorial or friendly, Cold water species or warm water species, etc. Many people simply combine the items in such a way that the animals are doomed right from the start – this is heartbreaking for everyone and unfair for the animals. So think ahead when planning your saltwater aquarium. 2. Choose your substrate – deep fine sand bed or shallow crushed coral. Either works fine – but a combo of both or a variation of either can cause problems. Here is a quick explanation: Deep fine sand bed houses Anaerobic bacteria (meaning in the presence of oxygen the bacteria will die). Therefore a deep sand bed (3-4″ deep) consisting of fine sand will allow the bacteria a large surface area to grow and thrive yet also keeping water from flowing around the particles of sand located under the first inch of sand bed. Shallow crushed coral beds house AErobic bacteria – these bacteria must have water to live as they are like fish in need of oxygen. The importance in this bacteria is that they eat nitrates – so by simply setting up the aquarium with this bacteria in mind at the beginning of the journey can automatically eliminate the issue with nitrates. ** remember – unlike a freshwater tank – if you have a deep sand bed – please do not siphon the sand – remember ANaerobic bacteria will die in the presence of water so siphoning the sand is a big NO-NO!! 3. Many people claim that a saltwater aquarium is harder than a freshwater aquarium. This is completely untrue. The main difference between saltwater and freshwater is the set up and equipment. If a saltwater tank is set up correctly from the start, it is far easier to care for long term. Getting the substrate correct, having live rock which also houses many different types of good bacteria and investing in a good protein skimmer are the 3 easiest things to do to be on the right path for a successful saltwater tank. 4. Once you start adding animals – plan you approach carefully. Since you have a list of animals you want to add to your saltwater aquarium – classify them as territorial or friendly. A great resource I use frequently is WetWebMedia.com – add the territorial fish LAST. 5. When thinking about saltwater corals – making your choices in the beginning can help avoid problems in the future. For example, acropora prefer pristine water and mushrooms prefer water with more nutrients. You can successfully keep both in the saltwater aquarium however it will require more attention to water changes, feeding and excess algae growth. When adding corals – think about your tank as real-estate. If your tank is 4′ long then you basically have 12′ of space to work with if we divide the space in sections from top to bottom as follows – high light, medium light and low light. By making a list of the corals you want and then classifying them as follows- you can determine before you make the first purchase a plan to follow and avoid the heartache of a new piece of coral failing to thrive. Here are some suggestions: Lighting: low, medium, high. Flow requirements: low, medium, high. Food choices, stinging – aggressive coral. Photosynthetic or non-photosynthetic. 6. Be aware: Some corals can overtake a tank. This may not be a problem if you never want to keep hard sensitive, slow growing corals. It may be a blessing to get a soft coral that you can encourage to grow on the back of the glass like a shag carpet – this makes everything easier if you never plan to add high dollar, slow growing corals. Remember, just like in real estate, location, location, location. So if you have a slow growing coral that needs high light in your saltwater aquarium and you add a fast growing coral that likes high light – guess who wins. You can keep both in the same saltwater tank – but this will require committed approach to harvesting the fast growing coral weekly to avoid it growing over the slow growing corals. Below is a helpful guide to make this a bit easier!